These baby bibs are not your everyday baby bibs. Seriously, you wouldn't use these bibs for simple every day use! They are fine dining bibs. Approx fits baby girls sizes : 3-12 and 12-30 months. 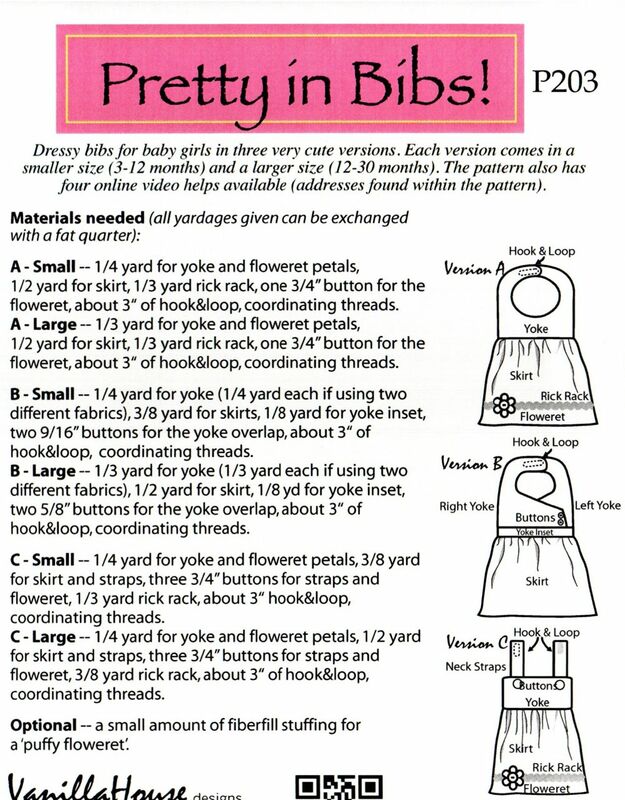 If you are planning to make baby bibs that will be donated to the Pregnancy Assistance Center they should be made with 100% cotton, please no buttons or other attachments which could cause a choking hazard. I have made 3 bibs and have lots of cute fabric to make them with. It is fun to decorate them with different appliques,rickrack, buttons, and ribbon. I also may tweek the pattern some, to suit myself. But all in all, the pattern is just perfect.